09/14/2016 – Thecus® Technology Corp. today announced the availability of Thecus Connect™, a remote WiFi connection app compatible with all Linux based Thecus NAS. By utilizing Thecus Connect™, users are able to gain live access to their NAS unit, enabling them to monitor the most up-to-date information. 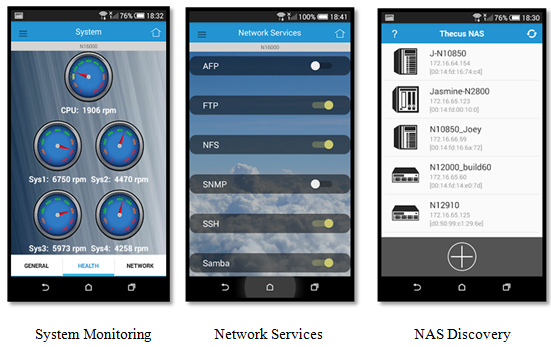 With NAS Discovery you can discover all Thecus NAS in your network, find your NAS by IP and keep a record of your connected NAS units for easier re-visit. While System Monitoring allows you to receive live feed and up-to-date hardware info, system status and network status. When not connected to network WiFi you can still access via an Offline view. Monitoring and ensuring your NAS is running correctly has never been easier. In order to use, please ensure your phone is connected to the same WiFi network that your NAS is connected. *WiFi-only for now. Expansion beyond WiFi connection will be released in the near future and will be rolled out in a future update. 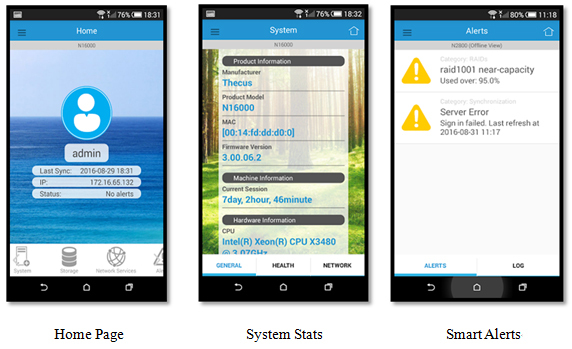 Thecus Connect™ currently supports only Android phones, iOS devices will be supported in the near future.